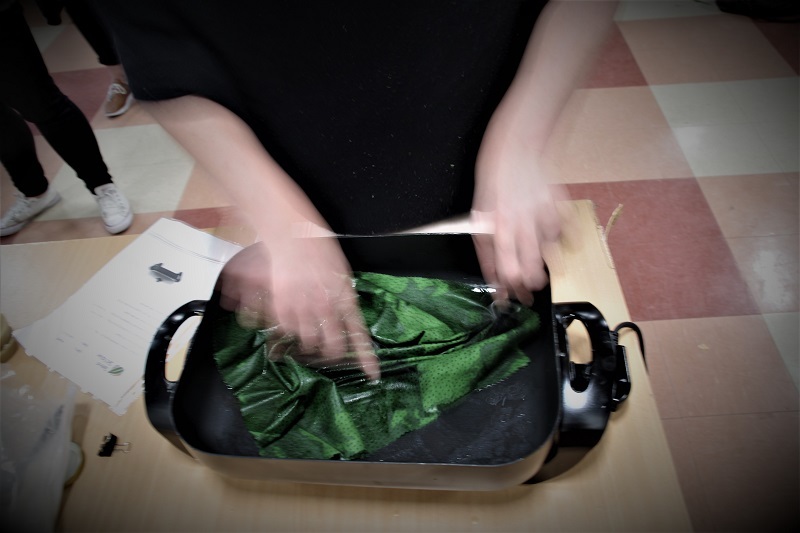 After starting with the Ironing Method, we introduced the Dipping Method to our workshops. For those participants who would like a refresher, here are the instructions. You will need an electric fry pan, crock pot, double boiler or a plain-old-pot-on-your-stove. And, your usual wax wrap ingredients: beeswax, powdered pine resin, and coconut oil. 1- Melt together: 50g of beeswax + 1 tablespoon coconut oil + 1 tablespoon powdered pine resin. Stir thoroughly. 2- Dip fabric into mixture until well soaked. 3- Use tongs to pick up 2 corners of the fabric, and lift up out of the pot. 4- Air dry by waving it back and forth. Once the bottom of your fabric is no longer dripping liquid wax, pop it down onto your table to finish drying … and your wax wrap is done! Interested in running this workshops for your organisation? For a quote or more info, contact the Green Skills Perth office – 9360 6667 or [email protected] We would love to hear from you!